A postcard is a rectangular mailer sent without an envelope. Sending a postcard is an extremely affordable way to communicate when you’re using the U.S Postal Service—regular postcards cost only $0.35 to mail! To qualify for postcard pricing, your mailer must be at least 3 ½” high, 5” long and 0.007” thick (approximately the thickness of an index card), but no more than 4 ¼” high, 6” long, or 0.016” thick. To qualify for the base rate, postcards cannot be folded. Large postcards can measure up to 6 ⅛” high, 11 ½” long and ¼” thick, but they cost as much as a First-Class Letter ($0.50 and up) to send. Business postcards generally have an image or call to action on the front, with space on the back for the delivery address, postage and perhaps a short message. Common examples include appointment reminders, sale or grand opening announcements, and real estate listings. They provide an easy and affordable way to market your products and services to customers, and they are also an inexpensive option when sending out holiday cards. When you combine the ease of sending postcards with the convenience of Stamps.com, you’ll reap a wealth of benefits. 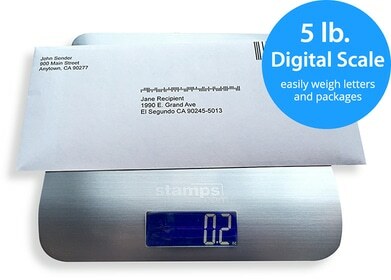 If you’ve already printed or purchased your postcards, Stamps.com allows you to print $0.35 NetStamps that easily fit on your postcards from the comfort of your own home or office. The ability to print exact postage means you don't have to waste money using excess postage when you don't have the appropriate stamps on hand…or the time to go to the post office to buy them. Stamps.com also offers blank PC Postage postcards (SDC-1400) so that you can create your own postcard campaign using Microsoft Word templates or any other design software. With the MS Word templates, you can customize a message for the front of the card and, in one simple step, print postage, delivery address and return address on the back. 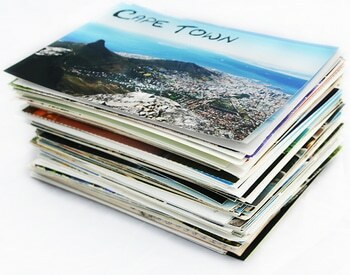 The templates are a fast and easy way to send postcards to your customers today!